This film is infused with Nicholas Ray's cinematic aptitude -- an expressive use of lighting, color, and camera angle; dynamic compositions within the Cinemascope frame -- and his trenchant social critique. 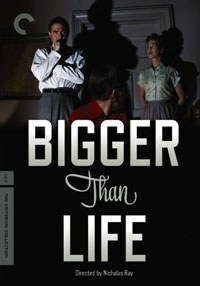 Bigger Than Life, the 1956 melodrama deemed by Jean-Luc Godard as one of the ten best American sound films, receives its belated video debut with this Criterion release. Along with providing a fascinating view of mid-'50s suburban America, the film is infused with director Nicholas Ray's cinematic aptitude -- an expressive use of lighting, color, and camera angle; dynamic compositions within the Cinemascope frame -- and his trenchant social critique. The film's opening minutes establish protagonist Ed Avery (James Mason) as an earnest middle-school teacher, with a tastefully appointed house in the suburbs and a loving wife and son. The Avery family would seem to epitomize a mid-century version of the American Dream, although Ed does have to attend to a moonlighting job as a taxi dispatcher, a situation he is hiding from his wife. He is also hiding the fact he is experiencing occasional spells of pain through his body. One night he passes out on the bedroom floor. Ed is hospitalized and presented with a grim diagnosis: he is victim of a rare disorder that will lead to his death within a year. There is one hope, a prescription to a promising new drug called cortisone, which can stem the pain and blunt the disorder, although there could be a few side effects. Ed takes the chance and responds favorably to the treatment but, on returning home, he starts to exhibit signs that the cortisone is influencing his mood. This is first seen as a sort of overstated happiness but, as Ed begins to go beyond the prescription and increase his intake, the symptoms turn to an inflated sense of self-importance, often expressed arrogantly, crossed with tearful breakdowns. As his delusional ego expands, Ed's cure becomes a real threat to the stability of his family. The rupture created by Ed's condition and growing drug dependency exposes anxieties wrapped deeply around the foundations of the Avery family, namely the middle class template they have so thoroughly bought into. From early in the film, a constriction in the life of the Avery family, marked by their money troubles, is a contrasting tension to their need to maintain appearances, and maintaining appearances is their first instinct. They worry that they may be dull, but what they really are is conformist to a fault. Mrs. Avery (Barbara Rush) in particular is tight lipped at one moment and barely holding it together another, as she reaches out to one authority figure after another to help restore the order she habitually accedes to her increasingly paranoid husband. Their behavior, as the situations gradually become more extreme, is like a prescient version of Arthur Kroker's 1980s theories of Panic Culture. Director Ray, in a 1974 interview published in the film journal Take One, suggested that, while the story was based on factual accounts of the side effects of then newly introduced cortisone, what intrigued him was a notion "that the character needs the drug as a habitual source of grandeur -- which he needs as a person." Ray identified this as a response to subtle traps built into the suburban middle class idea, casually identified in the opening minutes as exactly the things that are meant to be its virtues: the home they can't quite afford, the child who is an expense and responsibility, and the spouse you relate to through a set of imposed conventions. "Even the décor", referring to the Avery home, "represents an almost hopeless stretch for freedom". Although he expressed dismay over a "corny and embarrassing" ending -- which may strike some as tacked on and glib, while others may see its ambiguity as part of an overall critique -- Ray was reworking the rest of the script, more focused as a medical case history, towards a darker societal vision throughout the filming, one may assume with the blessing of leading man Mason, who also produced the film. Bigger Than Life may be Ray's most consistent movie. Keen character observations abound. Elements of Ed's grandiose behavior had already been seen in subtler, almost unconscious, moments, his slightly sarcastic reference to fellow teacher Pat Hind early in the film as an example. Later, her permissive and self-expressive classroom, seen briefly, seems one of the targets of Ed's reactionary rant at a PTA meeting. Fellow teacher and family friend Wally Gibbs (Walter Matthau), is also at the receiving end of Ed's sarcasm over a few modest signs of non-conformist activity. 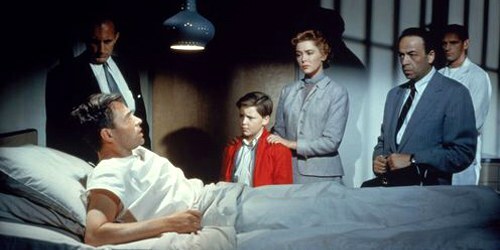 The strong presence of the physical environments -- school, hospital, Avery household – are a result of a well-planned shot and production design, yet there is nothing overtly overwrought in their presentation, even as the medical facilities seem impersonal and secretive (and Ed is very much a guinea pig in their hands). This element of Ray's talent, the control of mise-en-scene, is commented at length in the extras, and was also the source of the abiding respect paid the director by the theorists of the French New Wave. This edition comes loaded with Criterion's usual fine collection of extra features. Geoff Andrew's commentary is a bit dry, but extremely well-prepared and informative, with his reflections always relevant to what is onscreen. A video essay by novelist Jonathan Lethem offers a concise illustrated analysis of the film's design and the class issues raised by the biting portrayal of a mid-'50s suburban milieu. A 1977 television interview with Ray is included, as well as a recent video interview with his widow Susan, who describes Ray's temperament and aesthetic concerns. A booklet essay and the standard excellent graphic design round out the package, fully in keeping with Criterion's peerless presentations.